Crisis? 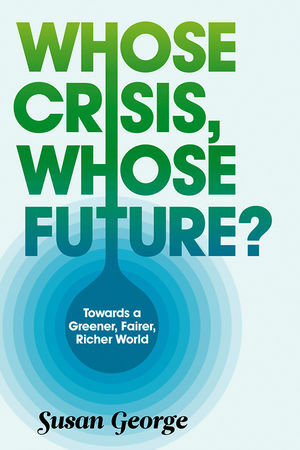 Whose crisis? Today we are in the midst of a multifaceted crisis which touches the lives of everyone on the planet. Whether it's growing poverty and inequality or shrinking access to food and water, the collapse of global financial markets or the dire effects of climate change, every aspect of this crisis can be traced to a transnational neoliberal elite that has steadily eroded our rights and stripped us of power. And yet our world has never been so wealthy, and we have, right now, all the knowledge, tools and skills we need to build a greener, fairer, richer world. Such a breakthrough is not some far-fetched utopia, but an immediate, concrete possibility. Our future is in our hands. Susan George is board chair of the Transnational Institute. "George has a brilliant capacity to see through the complex layers of a finance-driven world created by and for elites. She also, thankfully, has the intellectual sharpness and political passion to inspire the fight for change." "A very useful and eminently readable treatise on the present impasse." "George's passion and knowledge of her staggeringly broad subject matter can't help but come through." "An important read for those who believe change is necessary." Major new book from Susan George - a leading political commentator whose previous books have been massively influential and widely read and reviewed. Provocative and radical, this book could attract lots of media attention in addition to Susan’s large and loyal activist audience. Elucidates pressing global economic and ecological crises in a clear, personable narrative style aimed squarely at non-specialist general readers. Combines a systematic account of the current global crisis with a bold, ambitious program for social change.